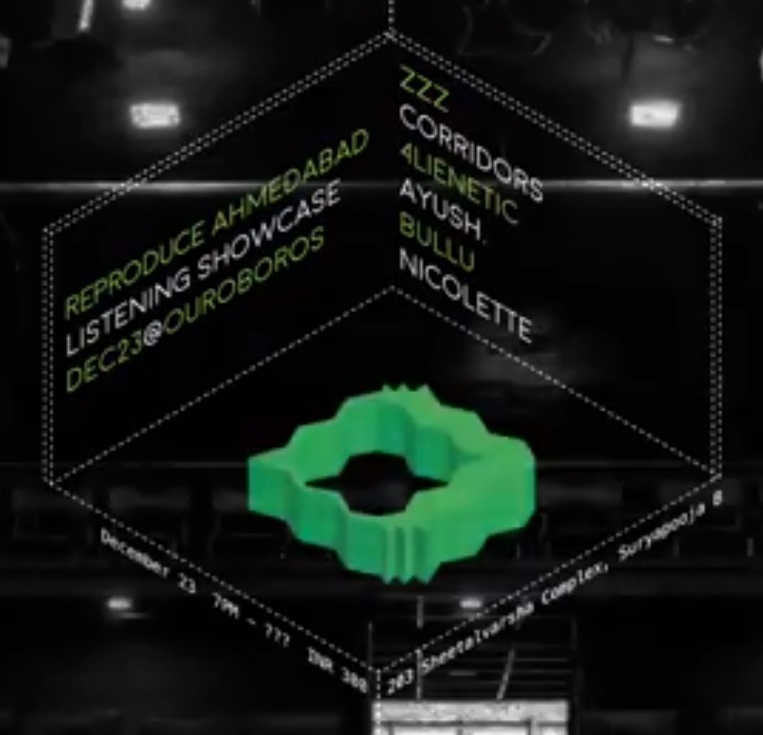 On Saturday, December 23rd, New Delhi based music collective REProduce Artists will return to Ahmedabad to showcase their Listening Room series, and in a new location – Ouroboros – Art Hub “Blackbox Theatre”. As both a space for performance as well as an arena dedicated towards fostering the development of local artistic talent, the theatre presents another pole in the rapidly changing landscape of the city; one what seems to be increasingly offering more options in terms of events and arenas to experience contemporary and relevant art. With the gracious assistance of Red Bull, weare thrilled to produce this space in the way we do. As always, the series aims to fill a gap in the ever iterating and increasingly varied community of live music in India by showcasing talent that might not get heard in the more mainstream oriented venues. REProduce Listening Room focuses purely on the music – in a space where an audience can absorb sound on their own terms. For this event, we will focus on the Black Box – a walled space enclosed by a main floor and a mezzanine – to showcase six artists, both local and from outside the state, with little in the way of suggesting who should be on “stage”, and who should not. It was over the course of our second REProduce Listening Room session at Exhibit 320 in Delhi that Rijul was suggested to me as someone we should consider. I didn’t know him at that point as either Rijul or Corridors, and likely for a simple reason: Corridors didn’t really exist in live form at that point. As a drummer with Delhi based progressive metal five piece Colossal Figures, it wasn’t as though he was short on experience; that project has been active since 2009. But we weren’t sure what a solo set of him performing live would imply. In speaking to him later about the experience, neither did he. What it did imply was a) a lot of bass, and b) a rather elated post-performance Rijul who, since then, has gone on to play not only with us on numerous occasions in Delhi and Bombay, but also many other venues; most recently as part of the Boiler Room showcase in Delhi. I’ve never seen two live sets of him event remotely resemble one another, so it’s a little difficult to surmise what he may or may not do, but in the past he has deployed sheets of noise, Zenguin, guitar passages, Komorebi, live drums, and a xylophone. It will be his first time performing as Corridors in Ahmedabad. Ayush has been producing his own work for some time, but has rendered himself more recognisable lately as the only Delhi based member of the Jwala collective. His work explores arrangements with piano, proxied strings, and delicate usage of EQ; allusions to moving water and wind, all deployed with a patience that seems to betray his youth. His last release, Annihilate, presented five pieces that hints at this patience, rendering arrangements that one observer described as “seamlessly flowing from one track to the next, absorbing you whole (…) [revealing] hints of an artist holding back; unsure of how much of his skill set he should reveal. It only makes his future releases that much more enticing.” For this performance – his first since August at a session we produced at Akshara Theatre in Delhi – we may just get a sense of what this future holds. This will be his third performance with us, and his first in Ahmedabad. It seems somehow hard to believe that I first came across Brij’s work not as zzz, or Three Oscillators, but as DISQUIET. A Soundcloud page emerged one evening while trawling for an act that could fit a more aggressively textured slot we were trying to fill for a Bombay session, something that the city rarely presents – but I did not make the connection to what this then 20 year old also possessed. A further irony here being that zzz was, in many ways, a new project that he suggested as a sort of experiment in “lo fi” – at the time of my suggesting he play under this moniker, he had three tracks released, but all of which pointed to something special. I still remain mostly unaware of what the term “lo-fi” means in theory, but in terms of his practice, I’d deem it as an exercise in samples, slightly off kilter, referencing a wide variety of cultural points of recollection, all deployed by a young man who possesses this remarkable aura of sn uncompromising focus in a live context. At least, as far as what the video I have been collecting of his many performances with us indicates. Brij played our first and last session in Ahmedabad as Three Oscillators; this will be the first time he showcases zzz here. As a prime example of how we curate these events, we came across 21 year old Sugam’s work via a suggestion from Ayush. To my knowledge, the two have never met; Ayush is in West Delhi, Sugam is in Bombay and their respective admiration for each others work was what served to connect them to one another. In listening to his work, it does make sense; the common references are clear, but unlike Aysuh Sugam comes from a background of playing guitar, and is currently engaged in formal training of the piano, ultimately aiming to teach others. His history of live performance is limited – his debut takes place in Bombay just six days prior to his debut with us, and we are very excited to showcase him here. While the drums may have been her first instrument – something she picked up and began to play seriously at the age 14 – a challenge bagel to emerge: how to balance her desire to sing with her desire to play live. For the past three years, the guitar presented the obvious solution. Nicolette was suggested to us by Moebius as someone we should put on for this event; in asking other peers about her, she seems to occupy this rather interesting space in a collective imagination – in Ahmedabad at least – as someone who has been playing for a very long time, possessing a certain character that seems to have left an impression on those who have met her. The reasons as to why will likely be clearer Saturday. It may be worth noting that her bio suggests she is also a hypnotherapist.